It’s all well and good rinsing out your bottles and cans to take to the recycling point – but how eco-friendly is your shopping list in the first place? We’re all being reminded of the importance of recycling but it’s also very important to choose eco-friendly or re-usable products. Lots of people make the mistake of thinking that opting for an environmentally-friendly version of a product means spending a lot more money – but often, the opposite is true. And even if a product does have a higher initial price tag it will save you money in the long run because it either lasts for longer – or uses less power. In short, if you don’t buy throw-away goods in the first place then you won’t need to worry about adding to our growing landfill sites. Next time you need to buy fairycake or muffin cases for baking, spend just a little extra and invest in silicon cake cases, which can be washed and used time and time again. They are better at keeping the shape of your cakes than the flimsy paper alternative. They are oven proof (obviously!) and can also be used in the microwave and stored in the freezer if you’ve made too many cakes. Another big waste in the kitchen is the amount of aluminium foil and baking paper that many households get through in a week. Why not buy a re-usable baking sheet which can be washed and used again in your baking tray instead of thrown away after one use? The sheets are also good at collecting grease and fat from foods such as sausage so you get a healthier meal too! If you’re a fan of packed lunches for work, then you are already cutting down on the waste from pre-packaged sandwiches and salads - as well as saving money. But how do you transport and store your lunch? Many people opt for ‘one time use’ plastic sandwich bags, tinfoil or clingfilm but you can save money and reduce waste by switching to a re-usable sandwich wrap which also doubles as a placemat for your food. It keeps food fresh and can be easily cleaned for re-use. It is made without PVC which makes it a greener option for sandwich packaging and comes in a range of patterns and colours. If you usually buy a hot drink on the way into work, you could also consider using a new long-life ceramic cup. Similar to a take-away coffee cup, it is re-usable and comes with a silicon lid. It can be washed after use and avoids throwing away a coffee cup every day! If you use a lot of cotton wool at home, take a minute to think about how bad this is for the environment. Every piece of cotton wool thrown away ends up in landfill somewhere – and many people use it on a daily basis for make-up removal, bathing eyes or applying creams. Washable cleansing pads are an eco-friendly alternative to cotton wool and can go into the washing machine afterwards. And, sticking with laundry, many people use gel pouches or tablets instead of traditional soap powder – but you pay for the convenience and the plastic packaging is bad news for the planet too. Consider using eco-friendly washing balls, which actually need less water but still wash your clothes well. The manufacturers of the leading brand of eco-balls claim that they last for an amazing 1,000 washes – offering huge savings on detergent and packaging. They clean by releasing ionised oxygen from mineral salts and because they don’t need detergent, you can skip a rinse cycle too. You could also invest in a drying ball which claims to cut the tumble dryer time needed by up to 25 per cent – but of course it’s even better if you can simply hang out your washing to dry instead. The type of products you buy on a regular basis will depend on your household – and factors such as whether you have young children in the house or whether you have time to cook from scratch rather than used pre-packed meals. 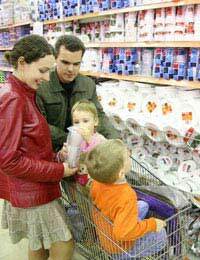 But most families could switch to more sustainable versions of many products on their shopping list. For example, if you use paper plates for special occasions, there’s a great new biodegradable plate and once it breaks down in the soil, you get a bonus in the form of sunflowers which pop up. You can find lots of ideas on environmental forums or by visiting the websites of eco-friendly retailers – but don’t forget the easiest switch of all. Take a shopping bag with you to avoid using plastic carrier bags.